Updated 4:08 p.m. | Posted 11:36 a.m.
A chain of well-known thrift stores is giving pennies on the dollar for donations it is collecting on behalf of three well-known Minnesota charities. That's according to Minnesota Attorney General Lori Swanson, who says she is filing suit against the company. It operates 15 stores in Minnesota, under the Savers, Valu Thrift and Unique Thrift banners. They're part of the nation's largest thrift store chain, and are owned in part by a Bellevue, Wash.-based company, owned in turn by private equity firms TPG Capital and Leonard Green & Partners. Swanson on Thursday called it a "triple scam" for donors. "The donor donates clothing thinking it's going to a community nonprofit at a community neighborhood donation center. But only a sliver ... goes to the nonprofit and the rest is pocketed by the for-profit fundraising company and its executives," Swanson said as she announced the suit. She also said that Savers doesn't give proceeds to the charities it lists at collection points and doesn't forward any proceeds for donations that aren't clothing. Those include the Epilepsy Foundation of Minnesota, the Disabled American Veterans chapter in Minnesota, and Vietnam Veterans of America. 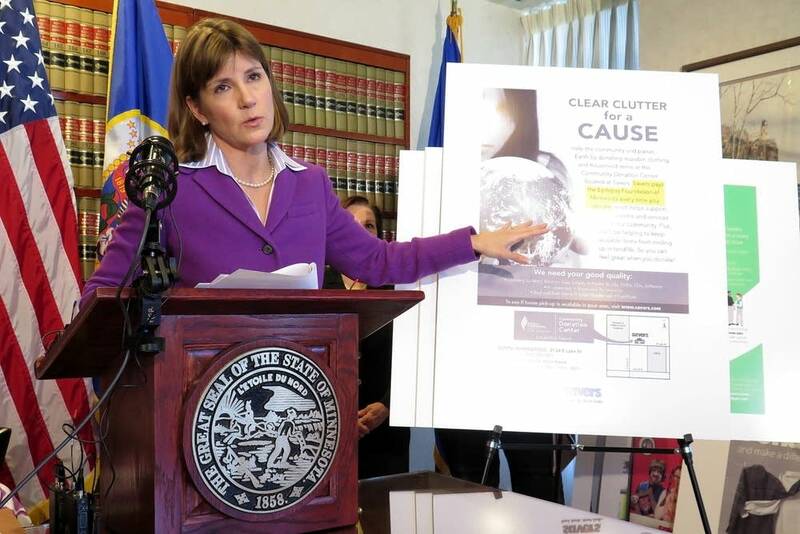 "Our goal in this lawsuit is ... to stop Savers from deceiving the public into believing donations of household products, lamps, furniture, toys, books, help a tax-exempt charity," Swanson said. The lawsuit, filed in Hennepin County District Court, includes eight counts, including operating as an unregistered fundraiser, misleading solicitations of donations and failure to properly disclose its operations to donors, as well as a number of financial misdeeds. Swanson went public in November with her criticism of Savers after her office conducted a year-long look into the chain and its relationship with a half dozen charities, including Vietnam Veterans of America and the Epilepsy Foundation. The company did not reply directly to Thursday's lawsuit. A statement from Savers on behalf of President and CEO Ken Alterman said that Savers has been talking with Swanson's office about its concerns and is disappointed a lawsuit has resulted. "Rather than allow these changes to take place and then evaluate their effect, the AG's office has decided to file this lawsuit and put more than 25 years of positive community impact and millions of dollars in annual charitable funding at risk," the company said. "The money we pay our charitable partners furthers medical research and supports veterans and their families across Minnesota," the Savers statement said. "We take this mission seriously, and we now have no choice but to vigorously defend our business and we are confident that we will prevail." The Epilepsy Foundation of Minnesota said in a statement that it learned of the lawsuit on Thursday. The statement notes that the foundation sells donated goods in bulk to Savers and that since 1997 those items provided more than $8 million to serve people with epilepsy through programs such as Camp Oz and Seizure Smart Schools. "Donor transparency has always been a priority for the Epilepsy Foundation of Minnesota," the statement said. "We've been helping people rise above seizures for 60 years and we meet all accountability standards of the Charities Review Council."